The Easter holidays are just behind the corner, so it's high time to talk about the beauty and the wonder of the Czech Easter holidays and arguably their most shocking aspect to foreigners: the famous "pomlazka". As a Czech, you sort of take the "Pomlazka" for granted, as something absolutely normal. You've lived with it all your life, after all. Well, that feeling ends when you explain it to a foreigner for the first time. Then you realize just how strange and awkward the tradition is. So what exactly is a pomlazka, we hear you ask? The pomlazka is an old pagan tradition celebrated on Easter Monday. It's a very old tradition (with written documents mentioning it in the 14th century and earlier) that probably predates the arrival of Christianity in the Czech Republic. On Easter Monday, young men walk with long, flexible whips made out of willow twigs, usually decorated with colorful ribbons, and whip the girls. The tradition has definitely survived to this age and we are afraid that we cannot restrict its application to the backlands of the Czech countryside - it's alive in Prague, too, although much more prevalent in the villages. The process is simple: young men walk from house to house (think trick or treating for young adults) and whip the behinds of the girls who live in them. In return, the girls give them (often decorated) eggs (and the parents give them shots of Slivovitz, we guess). 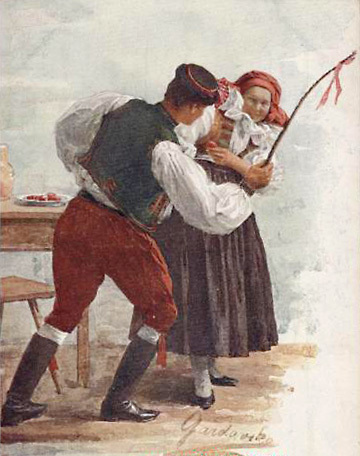 Yes, the metaphor is very simple, and we will not spell it out for you… It's basically a festival that celebrates the end of the winter and the arrival of spring, The whipping is supposed to promote fertility of the girl being spanked, which she demonstrates by giving an egg to the boy who whipped her. Girls are supposed to be very happy about and thankful for the whipping. Now, there are regional varieties. Jan's mom comes from Slovakia and girls are not whipped at all over there. But that does not mean they are safe. Instead of whipping, the boys usually shove the girls in the nearby stream… …several times a day. If there is no stream within a convenient distance, girls get blasted with water from a basket, water pipe, shower etc. Whatever is near. In some other areas, the girl do this to the boys who whipped them in the morning to get some revenge in the afternoon. There are also traditional foods associated with the Easter holidays. Although lamb is not that popular throughout the year, it is eaten on Easter. Eggs are eaten too, of course, along with "Mazanec" or "beranek", sweet bread with raisins and almonds, or Easter stuffing. So the moral of the story is: if you're in Prague or elsewhere in the Czech Republic and you see boys whipping girls, don't call the police. It's not domestic violence. It's a tradition. PS: There is a great web page in English that describes the Czech Easter tradition and even includes some recipes here.